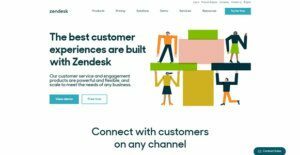 Zendesk is a suite of support apps that helps transform your customer service into agents for customer retention and lead source. It has one of the most flexible plan structures, making it ideal for business of any size. It consists of customer service, chat, call center solution, and knowledge base modules that you can upgrade separately. Deliver seamless customer service through Zendesk Live Chat, one of the simplest but best ways to engage high-value leads when they land on your website. Studies have shown that customers are three times more likely to buy when they get chat support right when they need it. The chat comes free but can be scaled for unlimited chats, conversation tracking, widget unbranding, and other advanced IM tools. The Zendesk Live Chat is designed to help businesses differentiate themselves from competition, provide enhanced customer experience, and offer 24/7 access to on-demand support to clients. This Live Chat solution enables customers to multitask, generate chat logs for proof of contact and transparency, boost sales, eliminate unnecessary costs, collect valuable data, and make customer service available all the time. Its Zendesk Support solution puts all customer interactions in one dynamic, user-friendly interface for an efficient, seamless process. You can bring in customer queries from almost any channel via pre-defined ticket responses, web widgets, and customer search history, allowing you to respond faster and with the right context. The main customer service support module can also be customized to fit your customer service workflows or apps that you’re already using. It also features customer satisfaction ratings and analytics via performance reports and dashboards. Along with its robust Help Desk app, the Zendesk customer service platform also lets you develop institutional knowledge culled by your support team over the years. The Zendesk Support Guide module helps you build a help center, online community and customer portal. You can direct FAQs and low-touch tickets to this portal, while your agents deal with high-value customers and sales leads. An AI Answered Bot can also direct queries to relevant articles in your base, squeezing out more ROI off your content marketing budget. Zendesk also gives you the option to set up a call center with online, mobile and messaging channels. This is ideal for highly engaged customers or prospects; your agents can quickly connect to them via an automated trigger. Through the integrated live chat, your agents can also proactively engage customers on your website or e-commerce page. You can also use analytics here to make sense of the conversations collected by your call center. A few minutes of quality conversation with a client is far more powerful than exchanging numerous emails. This is why integrating Zendesk Live Chat to your online site allows you to help your client in real time, and this boosts their satisfaction and loyalty to your business. Live chat also provides that crucial opportunity to have a conversation with a customer during that important stage when they’re about to decide to make a purchase or not and this tool increases the possibility of a client making a purchase. Zendesk’s proactive live chat with automated trigger lets you engage prospects who are lingering on your website or checkout page and offer assistance. You have a small window to convert these prospects while they’re interested in your product, and the live chat connects you to them in real time. Companies have different wants and requirements and no software solution can be perfect in such a scenario. It is useless to try to find an ideal off-the-shelf software system that fulfills all your business needs. The intelligent thing to do would be to customize the solution for your unique wants, employee skill levels, budget, and other elements. For these reasons, do not hurry and pay for well-publicized trendy solutions. Though these may be widely used, they may not be the perfect fit for your particular requirements. Do your groundwork, check out each short-listed application in detail, read a few Zendesk reviews, call the seller for clarifications, and finally select the application that presents what you require. We realize that when you make a decision to buy Live Chat Software it’s important not only to see how experts evaluate it in their reviews, but also to find out if the real people and companies that buy it are actually satisfied with the product. That’s why we’ve created our behavior-based Customer Satisfaction Algorithm™ that gathers customer reviews, comments and Zendesk reviews across a wide range of social media sites. The data is then presented in an easy to digest form showing how many people had positive and negative experience with Zendesk. With that information at hand you should be equipped to make an informed buying decision that you won’t regret.